Follow famed violinist Isaac Stern on his cultural exploration of China. Day Four of Oscar Winners Week. There’s a good chance that any talk of art’s ability to transcend cultural boundaries will turn sappy and sentimental, but that’s because it’s a fact. Where an ambassador may fail, a painter may find common ground. In this film, Isaac Stern states that the quickest way to understand another culture is to find a professional in your own field. That’s what he’s doing in China, traveling from Peking to Shanghai, listening and teaching in equal measure. From Mao to Mozart is an understated but inspiring story, not just about how art can bring people together, but how it can save them. China is a nation still in the birth pains of massive societal upheaval. The stress of the opposing forces of tradition and modernity, of socialism and capitalism, reverberates throughout the populace. Under the laws of the Great Leap Forward, Western music was forbidden. Musicians were only allowed to play traditional Chinese instruments and songs. One conductor trembles as he recounts being locked away for playing Beethoven. When Chairman Mao died and the state relaxed its grip somewhat, the question arose of what outside influences to allow in. This film takes place right on the cusp of China’s economic revolution, just a few years after Mao’s death. When Isaac Stern came for a visit, the country was living in Mao’s shadow, still afraid to break even the smallest rule for fear of reprisal. As the doc’s title suggests, this is a story about men and women beginning to stretch their wings and embrace a newfound (comparative) freedom. There is no “good” or “bad” culture, and there are aspects of Chinese socialism that one has to admire. The people show a staggering intensity and focus on whatever they pursue, whether it’s the violin or gymnastics. Their dedication is absolute, and they make cooperation and coordination look so easy that it shames us. Practice is paramount to producing good music, and the Chinese musicians have it down pat. It impresses Stern and it impresses us. However, that doesn’t mean there isn’t a thing or two they could stand to learn from a Westerner. In working with the musicians, Stern constantly has to push them to loosen up. Their extreme discipline, while giving them great ability, stifles their true creative potential. Even as a tone-deaf music plebe, I could detect that their playing was mechanical and joyless. Stern is a patient, articulate teacher, and he slowly coaxes the students’ warmth and love into their music. The difference is striking and beautiful. It’s like watching a lovely chrysalis break open to reveal an even lovelier butterfly. The curious thing about the Chinese musicians is that they almost don’t seem to properly comprehend music. Upon arrival in Shanghai, Stern discovers that the symphony he will be working with is using a piano in atrocious condition. He goes on about how badly it sounds, and receives blank stares in response. Decades of repression have blunted their taste buds. Finding true music again, finding not just Mozart but the heart of the old Chinese songs, awakens a dormant thirst for expression. Everything about this film is very low-key and straightforward. If this makes any sense, it feels rather Chinese in that respect. It is unassuming and functional. That is, until the music plays. When bow meets the string, when lips meet the horn, that’s when the movie comes to life. It doesn’t explode in emotion or anything bombastic, it simply morphs into something tender and resonant. Men and women, students and adults, bleed their souls for the camera. In a country where speech is restricted, they can tell us their lives with a note. As Stern tours the land, he sees the drastic contrast between the relatively modern cities and the near-feudal rural areas. It’s a vivid illustration of the larger conflict in Chinese society. It’s a conflict that still wages today. As people like Ai Weiwei demonstrate, artists can play a vital role in combating tyranny. I’m not going to suggest that China “needs” Westerners to always come in to show them how to feel, as if we’re Kevin Bacon in Footloose or Kenny Wormald in the other Footloose. 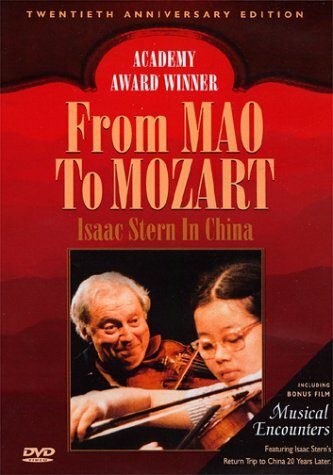 But cultural exchange is always valuable for both parties, and Isaac Stern’s journey in From Mao to Mozart is a sterling example of this.